Size: 6.5" x 3.2" x 1.8"
Roughly one year [or later - continue here] after the introduction of the famous TI-2500 alias Datamath the engineers at Texas Instruments added a full memory onto the calculator chip. Integrated into a housing similar to the wedge shape of the SR-11 it was named TI-2550. The first calculators used a display module without magnification lenses (actually a Bowmar Opto-stick), later TI-2550 calculators got the bubble lenses known from the TI-1200 and TI-30. A close relative of the TI-2550 was sold through the American department store Montgomery Ward. Compare the TI-2550 with the P200. The same housing and a very similar keyboard was used by the TI-150. Recently we received from a fellow engineer of a Dallas based company a parcel with some calculator prototypes. • The TI-2550 was introduced later in 1974 as we assumed. used the single LED-modules instead the Bowmar Opto-stick. 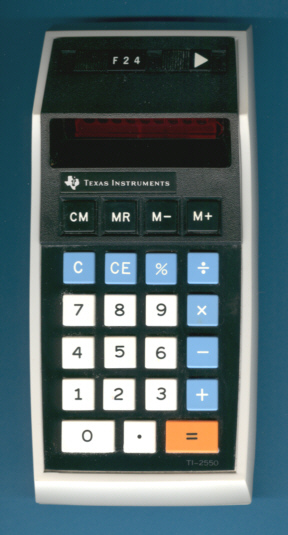 The TI-2550 is featured in the Texas Instruments Deutschland GmbH leaflet ER-1975 dated 1975.